Governor’s seating position during special events along the Batanghari River. Recently we wrote a post about “Ancol,” which mentioned that the location well-known by that name is more officially known as “Tanggo Rajo.” We’ll elaborate on Tanggo Rajo with this post and explain the origin of that name. According to oral legends (from the 1600’s) there was a location along the Batanghari River, in the City of Jambi, where the king would sit in the evenings, enjoying the sunset along with others from the royal court. It is also said that there were two levels along the bank of the river at this location, and on the upper level a seating area was constructed with a special seat for the king. This special seat was to have had a swivel base which would allow the king to turn in any direction he wished, whether to face the breeze or to watch the boats passing by. 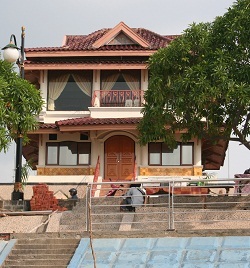 Today there are still two levels along the Batanghari River at this location. 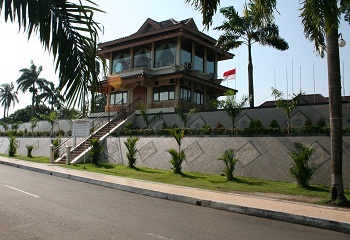 At the upper level there is a very nicely constructed building which, following legendary custom, is used for seating the Jambi governor and other dignitaries when there are special events taking place, like the boat races on Independence Day. To the south of that building is the Governor’s office / home. Today Tanggo Rajo (Ancol) has become a nightly location for Jambi people to enjoy conversations with friends, the sunset, and the famous food/drink, known as jagung bakar (roasted corn) and air tebu (sugar cane juice).